School is back in session (or will be soon) and if you’re like us, you’re knee deep in back-to school shopping. 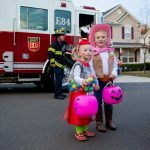 But, why should our kids have all the fun?! This year, we decided to treat ourselves to new bags… camera bags! 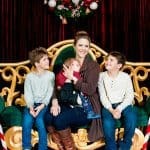 Because, let’s be honest; these days if you’re a mom, you’re likely a mom with a camera. 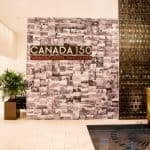 Whether that camera be your smartphone, a point-and-shoot or a DSLR; between now and next May when school is out again for the summer, there will be many an event to capture. 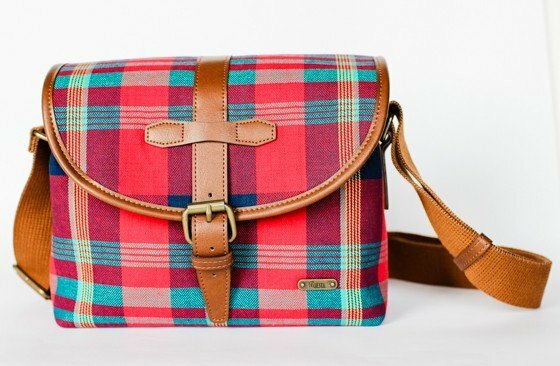 So, toss out your old bag and upgrade to one of these stylish camera bags! Those are the features Capturing Couture had in mind when designing their line of high-end camera bags for fashion-forward photographers. Made in the USA, Capturing Couture’s signature design boasts vibrant, unique patterns (Bohemian Rhapsody is our favorite!) in the thickest and richest of fabrics. Its fully lined interior comes complete with an adjustable/removable divider to suit your ever changing day-to-day camera bag needs. Measuring at 12″ wide by 6.5″ deep, the interior of this bag will fit one DSLR body with lens plus one extra lens or flash. There are plenty of hidden pockets and compartments both inside and out to stash camera cards, cash, keys and cell phones. With an adjustable velvet lined shoulder/cross-body strap and swivel nickel hardware, this will quickly become your go-to bag when photographing trips to the beach or upscale weddings. 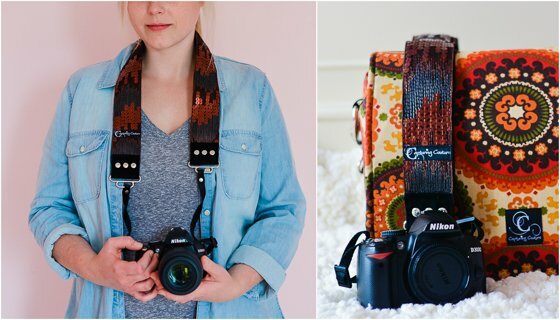 Complete your photographer look with one of Capturing Couture’s stylish and versatile camera straps. Velvet lined, each one of their straps will provide the ultimate comfort while you’re shooting away! The Sequin Ombre Copper Strap is the perfect addition to any photographer’s DSLR. Fun and sophisticated, this strap is the perfect combination of having the ability to stand out or blend in when necessary! As photographers, we’re always moving during shoots, whether that includes climbing over rocks while trying to get the perfect angle for the sunset or teetering on benches to get the best shot of your kids feeding giraffes at the zoo. Sometimes carrying your equipment around in a shoulder bag can be cumbersome and you just need more freedom to be able to move wherever and whenever inspiration strikes. It’s time to pack up your camera and move it into a new home. 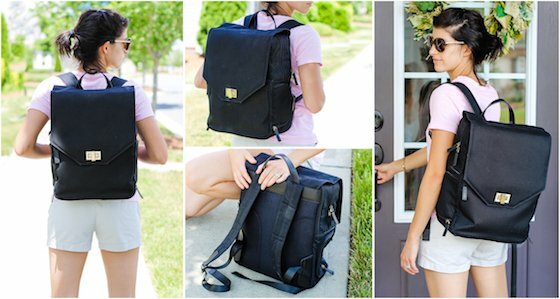 The Bellbrook Backpack by Jototes gives you a convenient, hands-free, and stylish way to carry all your camera gear while on the move. This high-quality waxed canvas and leather Bellbrook Backpack offers you a versatile and organized way to carry your camera equipment and other essentials you need for a day of shooting. The multiple divider systems and padded inserts give you organizing options so you can customize your backpack to perfectly fit all your gear. All dividers and inserts are completely removable, so if you ever need to use your backpack for just a backpack, then go for it. 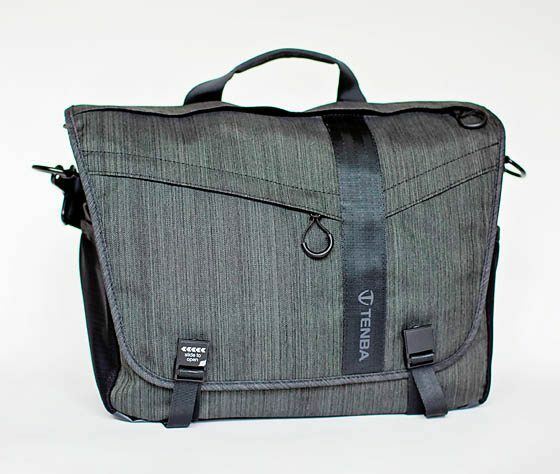 The included laptop sleeve can fit up to a 15″ computer, and the two side pockets allow you to quickly access your camera. 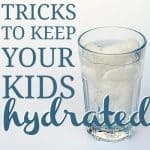 With all the extra pockets and pouches, you’ll be sure to find a place for your wallet, keys, phone, and even diapers (if you’re shooting sweet babies), so there’s no need to carry an extra purse or bag! Did we mention how gorgeous this backpack is? Available in black or gray, with water-resistant fabrics, and a brushed nylon interior, you can take the Bellbrook Backpack anywhere and you’ll look good. The clean lines, simple design, turn lock closure, and wearable comfort make this backpack the ultimate camera bag. 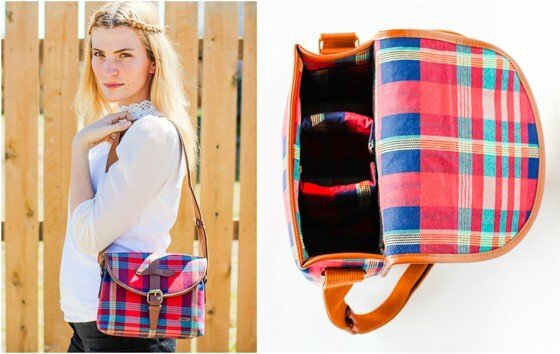 If you are looking for a camera bag that makes a bold statement, this plaid camera satchel by Photojojo is perfect for you! Tote your camera and extra accessories in the main compartment or use the removable and adjustable separators to expand the versatility. With all of this space available, it is amazing how compact this camera satchel is. Not only do we LOVE the look of the stunning plaid color and tan leather accents, we also love the magnetic snap, brass buckle, moveable separators, and the two interior pockets. This camera satchel is designed not only to make a statement, but is also built to last, crafted with long-term use in mind. Perfectly sized at just 4 x 9.5 x 7 inches, and with an adjustable shoulder strap, tote your gear in style. 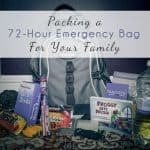 Some of us would like to bring our nice camera to a friend’s wedding, sister’s baby shower, or anniversary date with the hubs — but don’t want to lug around two bags. 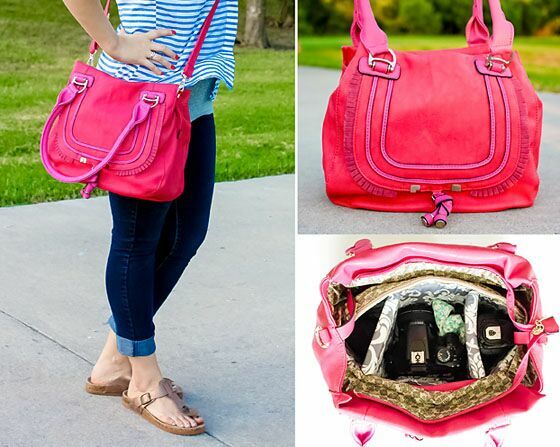 We want a fashionabledate night purse, with the functionality of a camera bag. Well, the designers at Pompidoobelieve that fashion and function are not mutually exclusive qualities for a camera bag. To prove it, they’ve created beautiful, boldly colored, stylish camera bags out of high-quality, soft-yet-durable, Italian leather. Their top-selling Cologne bag is the epitome of fashion-meets-function. 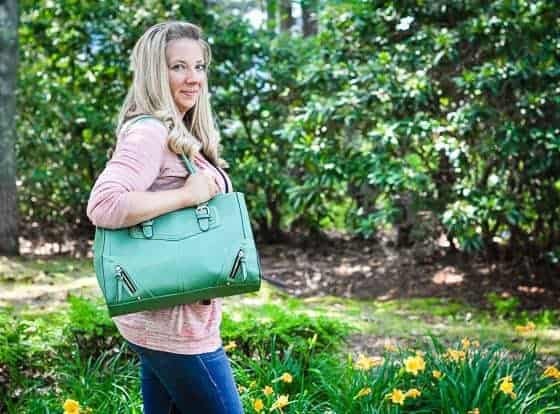 Fashionistas will love the trendy shape and shoulder strap, the eight neutral and jewel-tone color options and beautifully crafted leather design. Meanwhile, shutterbugs will love the bag’s three customizable, removable dividers and cushioned padding for easy storage and organization for their camera, lenses/flashes and accessories. 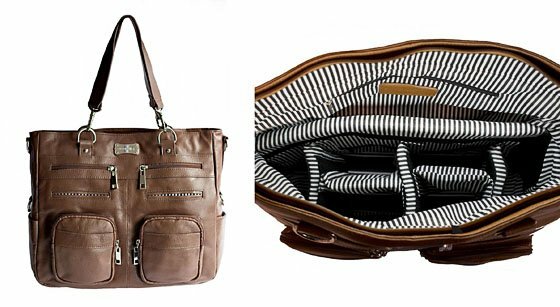 Bonus: this bag can definitely handle mom-duty, too, with ample room for diapers, wipes, toys and more! 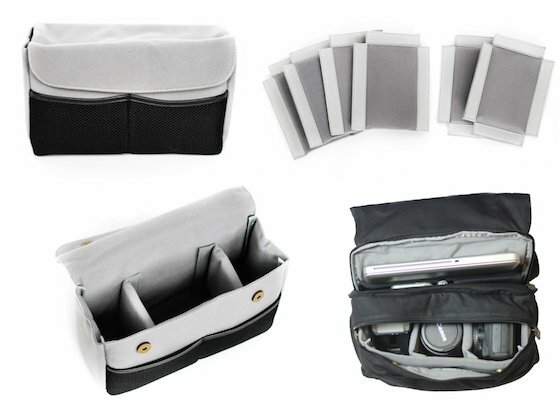 Use the removable dividers to separate your camera and accessories from your kiddos’ stuff! 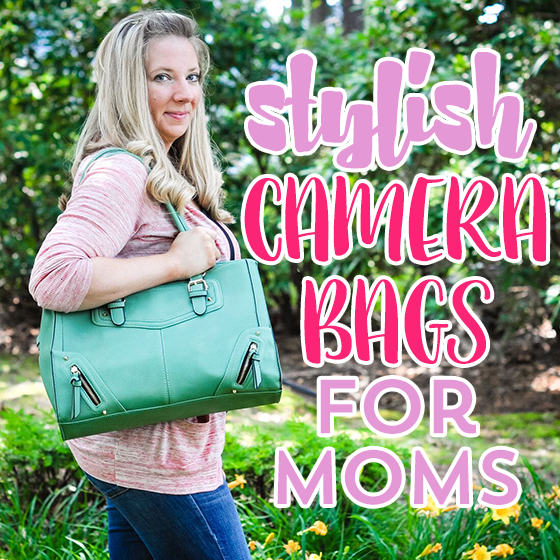 As a mom with a camera, versatility and style become two of our biggest priorities when it comes to selecting the right bag to carry our camera in addition to all the other stuff (wallet, diapers, random toys, etc). 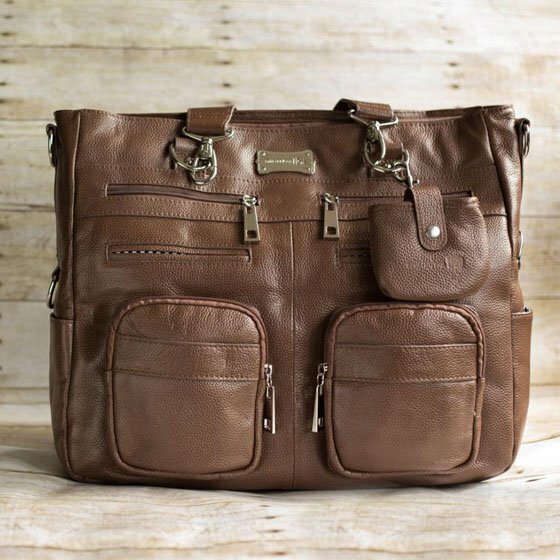 With that in mind, we were thrilled to find the Heirloom; Shutterbag USA’s largest and most versatile bag! If you’re familiar with Shutterbag, then you already know that all of their bags are made of genuine leather with cotton muslin lining, but that’s just the beginning of why we love this bag. The Heirloom is designed to carry a full sized laptop (up to 15 inches) in addition to your camera body and 3 lenses (or 2 lenses and flash). Unlike many other camera bags on the market, this bag will fully accommodate your professional body (5d Mark iii) as well as a 70-200mm lens with absolute ease. 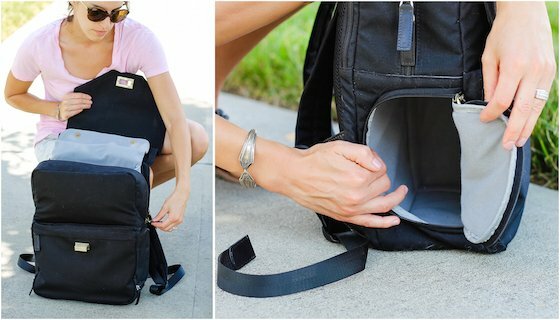 In addition to carrying your camera gear, this bag features lots of great pockets perfect for storing or toting all kinds of things. 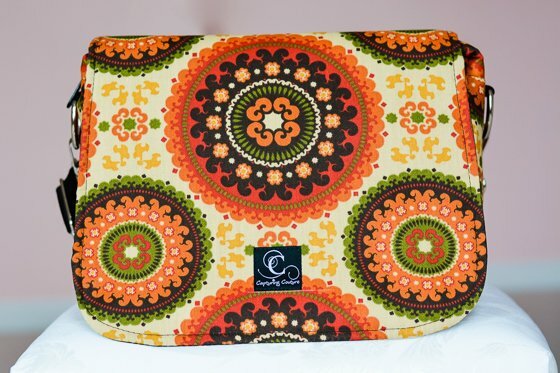 The back has a large zippered pocket that is 12 inches wide by 10 inches tall, while the front has two large zippered pockets that are 5 inches wide by 5.5 inches tall. There are also two slotted pockets that are 5 inches tall by 5 inches wide, as well as two more zippered pockets near the top of the front that are 5.5 inches wide by almost 5 inches tall. There are pockets on each side of the bag, too. The Heirloom is a 5-in-1 bag. One of the things we love most about the Heirloom is that the straps can be configured in a variety of ways to suit your needs. Use two medium adjustable straps to convert into a comfortable backpack. Perfect for chasing your little ones on the playground. 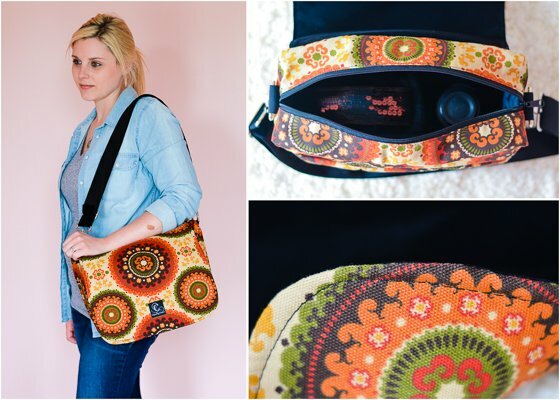 Use the long, adjustable shoulder strap to wear across the body like a messenger bag. Use two short carry handles so it can be used like a tote bag. Use two short carry handles criss-crossed in the back to secure to any generic suitcase trolley, turning it into a roller-bag or attaching to your stroller! With beautiful soft leather and thick internal padding, not only will the Heirloom protect your camera, but it will prove to be a good investment for your gear and your wardrobe. 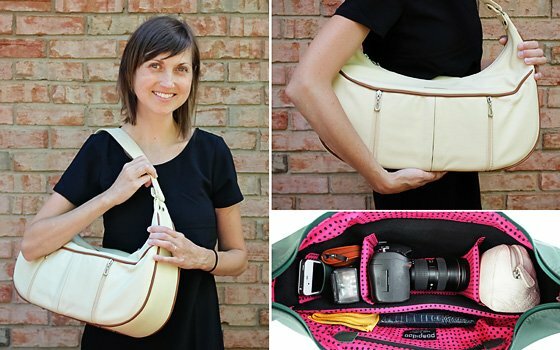 If you’re on the hunt for a camera bag that’s just a bit different than the average camera bag – and one that doesn’t scream, “There’s a camera in here!” a bag from Shutterbags should be your top choice! Each bag is handmade by the shop owner, Lynn, who takes beautiful handbags and transforms them into camera-safe bags with plush interiors. 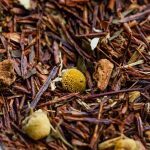 This Etsy shop is constantly bursting with new products, so check back often for Lynn’s latest styles and seasonal pieces. 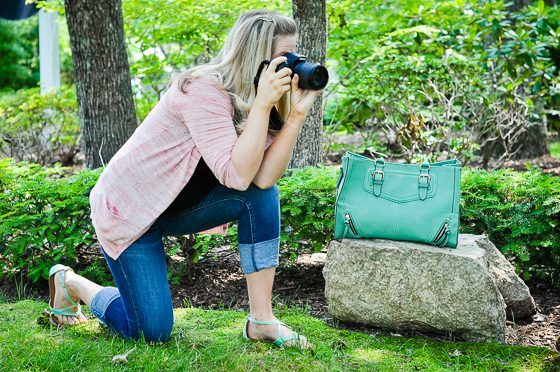 This beautiful camera/laptop/ipad Shutterbag (green version shown here) is made of cruelty-free, buttery soft vegan leather, and has a spacious interior (16″ long 6″ wide and 11″ tall) that will fit your DSLR camera and 3-4 different lenses, or other pieces of equipment like a speedlight. The padded camera section is customizable, with one padded panel that you can remove or move around to fit your equipment. With remarkably sturdy straps and plenty of room and compartments to store other personal items, you can fit everything you need for a photo shoot for a client or a day at the zoo with your family. Our favorite part about this bag (and the entire Shutterbag collection), is that it looks like a handbag. When you’re out and about with this bag, it conceals your expensive equipment, lowering the potential for theft. We also love this pink fringe bag by Shutterbags, which is as roomy and practical as it is beautiful. 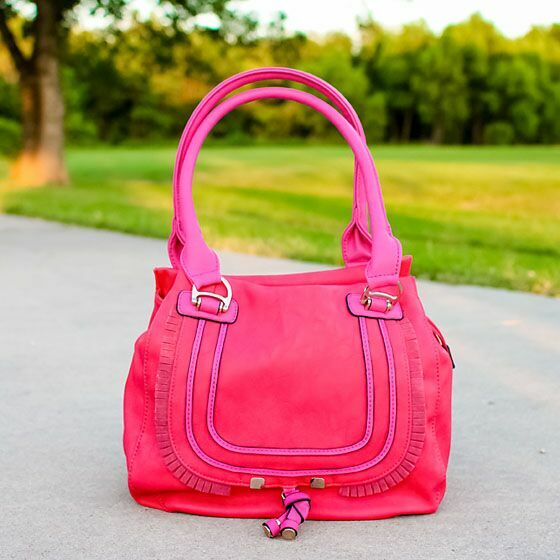 The stunning hot pink color is sure to accent any outfit, while the interior of this bag is loaded with 4 pockets for filters, phone, lens cap and personal items, a full zip closure, and 2 additional storage sections apart from the camera compartment. The bag is tall enough to store your longer lenses, and features a back outside pocket to store keys or a lens cap. The pink fringe bag offers protective padding, and one of the dividing pads can be removed to fit in larger pieces of equipment. 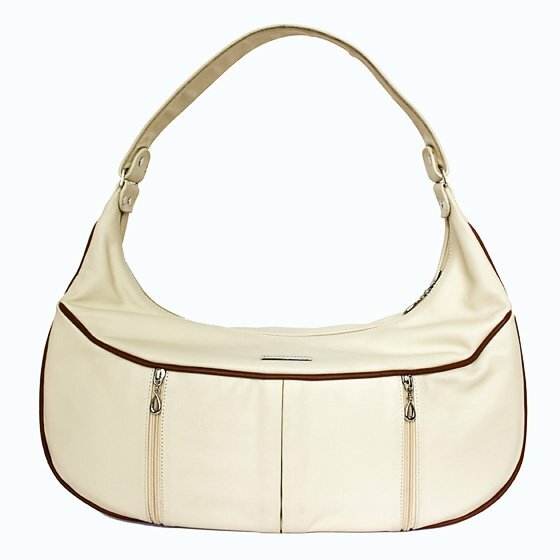 You can wear this as a shoulder bag, an arm bag, or even a cross-body bag, making it the perfect accessory for moms on-the-go. 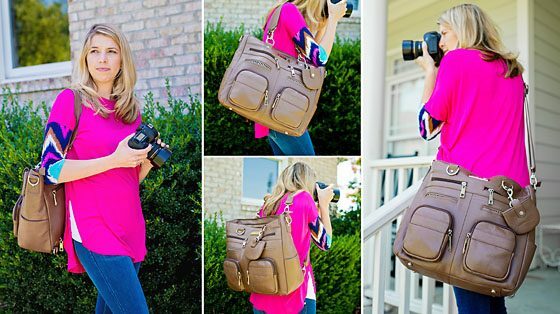 Stay fashionable and functional with any one of the gorgeous camera bags by Shutterbags, and you’re sure to turn heads while having easy access to your photography gear and anything else you need throughout the day. Since this company is constantly releasing new products and one-of-a-kind pieces, follow them on Facebook to keep up with the latest styles and get the scoop on the cutest new bags in their shop! 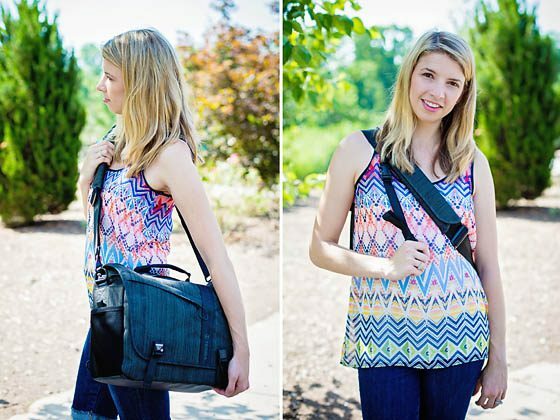 For the photographer mom that prefers a more functional bag, look no further than Tenba’s DNA 13. 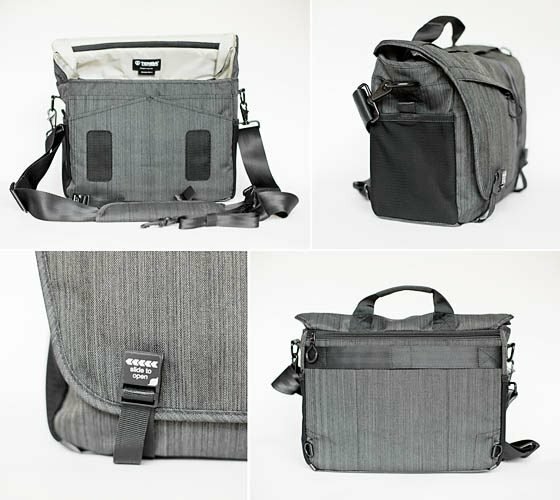 While not the “prettiest” bag we’ve featured, this messenger style bag is all about speed, stealth and versatility. Get at your camera, tablet or laptop gear quickly, and do it all without anyone knowing that you have expensive equipment in tow. The DNA 13 was designed to provide the kind of year-round, all-weather, rugged performance demanded by New York City bike messengers, but with an interior that’s tuned to protect delicate cameras, lenses and computer gear. 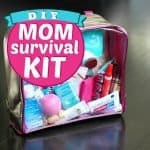 We find that bike messengers and moms have a lot in common with regard to needing a bag designed to meet the everyday demands of motherhood. 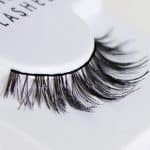 The front flap extends over the top of the bag and has a sewn hinge to ensure easy closure and excellent weatherproof coverage at the corners. For additional wet weather protection, the bag includes a removable and reversible Weather Wrap cover that’s silver on one side to reflect the heat, and black on the other side for a bit more stealth and subtlety at night. To prevent the bag from sliding forward while riding a bicycle or scooter (or just when you’re chasing the kids), an adjustable security strap connects to D-rings on the back of the bag which anchors it in position behind you. Fidlock patented magnetic clips allow blind, drop-on attachment and a fast unique slide release. This is the quickest clip in the world. 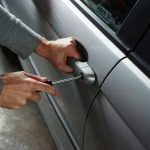 It can be both secured and opened with one hand, even when wearing gloves, or when the bag is behind you. The shoulder strap combines smooth-sliding seatbelt webbing and a contoured, non-slip shoulder pad. The non-slip pad grips the shoulder while the seatbelt webbing slides through smoothly, making it quick to move the bag from front to back. The rear padded sleeve will hold a laptop up to 13 inches, and a second sleeve will protect an iPad or similar sized tablet. If you’re a mom who needs to carry a mirrorless camera with 4-5 lenses, or a DSLR with 2-3 lenses, the DNA 13 is really an ideal bag; especially if you’re looking for something that is functional and sturdy. We also love that the inside is completely removable such that you can quickly and easily move your gear from one bag to another. 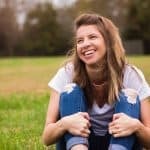 Previous articleMoms vs. Non-Moms: How did they stack up?